24 May 2005, 11:20 am. Highpoint #18. 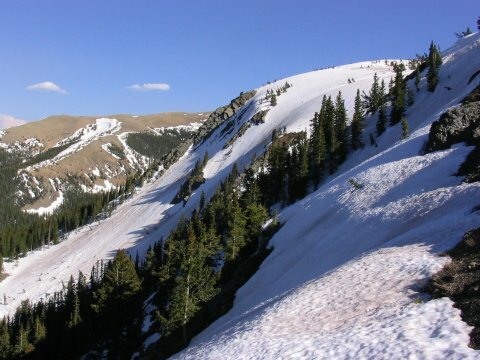 On Mon 23 May, I drove to the Taos Ski Valley and the trailhead to Wheeler Peak via Bull-of-the-Woods Mountain. I set out on the trail at 10:30 am, carrying a nicely loaded pack, including snowshoes that I rented from Cottam's Ski Shop in Taos. 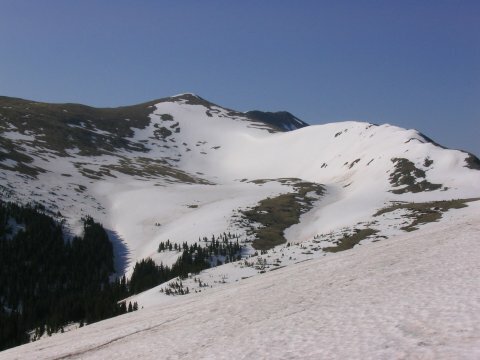 The trail was initially free of snow as it ascended parallel to a raging creek. 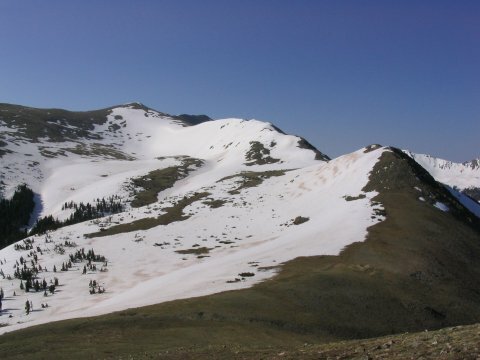 However, isolated patches soon appeared, and by about 1.5 miles in the trail was completely and continuously snow covered. When I reached the fork between Bull-of-the-Woods pasture and the trail to Wheeler, I took a short rest, greeting a group of other hikers who were the only other people that I would see until I was almost back to the car. I turned right, and followed previous ski and boot tracks along the flank of Bull-of-the-Woods Mountain. Up to this point, I had not put on the snowshoes, as I was not having trouble with postholing, partially by examining previous tracks to see where the snow was firm. Eventually, however, I came to a drift of very soft snow, with steep and loose terrain on either side that made it difficult to bypass. I tried getting through with boots, but only managed to collapse into the snow, unable even to stand up without removing my pack. This was my cue to don the snowshoes! 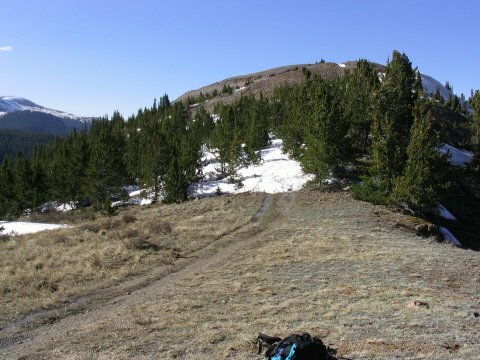 I continued on to a open saddle just past Bull-of-the-Woods Mountain where an old fence partially stuck out of the snow, about 3 miles in from the trailhead, where I set up camp. The weather was starting to look threatening, so instead of pitching my tent in the open area (which would have been most convenient), I headed down a bit into the trees, trying to find a more-or-less flat spot in the snow for the tent. I was mostly successful, but this was a little annoying as I needed to wear the snowshoes to go back and forth to the tent to avoid postholing. The clouds were getting more ominous, so I retreated into the tent, took off my damp socks, slipped into my sleeping bag, and took a nice hour and a half rest as I listened to some thunder not too far off in the distance. Around 5 pm, I got out to a now clear blue sky, and started the chores of melting snow and cooking dinner, while taking in the view from this pretty place. Views from near my campsite. Bull-of-the-Woods Mountain from near the campsite. I woke up the next day at 5:45 am. This was supposed to be about an hour before sunrise, which was at 6:50 according to my GPS, but I had neglected to adjust it from Central Time, so the sun was already up when I got out of the tent. I melted some more snow, had some tea and ate a little for breakfast before setting out around 7 am. The route continued up P 11762 and on towards Fraser Mountain, still mostly snow covered. Looking back towards P 11762. However, as the trail went beyond treeline, it cleared up, and stayed mostly free of snow up to the top of Fraser Mountain. 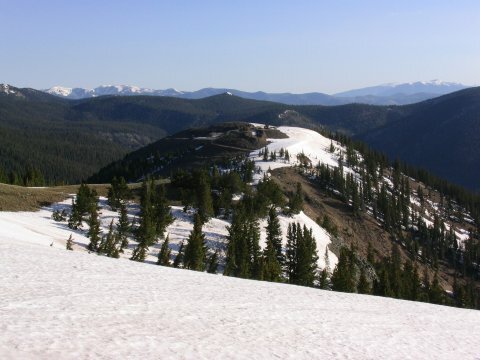 From there, the normal summer trail headed down into La Cal Basin, which had plenty of snow. 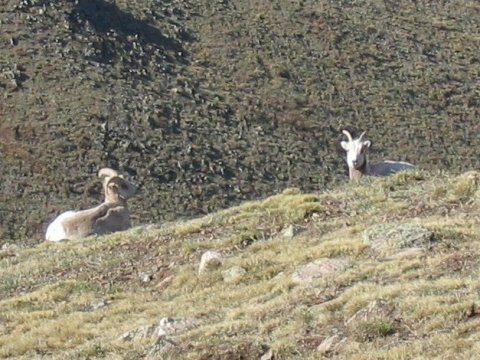 The snow on the slopes above the basin posed a possible avalanche threat, so I left the summer trail and headed instead for the connecting ridge between Fraser and Mount Walter, passing near a couple of bighorn sheep. This ridge was a combination of grassy slopes, Class 2 talus, and snow. I tried to wear the snowshoes as much as I could, partially for the extra grip from their crampon-like teeth. I was further induced to use the shoes when, while boot-hiking on the approach to the connecting ridge, I postholed into about a foot of water, soaking my right foot. A better view of the connecting ridgeline. Bighorn sheep on the slopes of Fraser Mountain. I reached P 13045, a gentle subpeak of Walter at the end of this ridge, and continued on snow to the summit of Mount Walter. 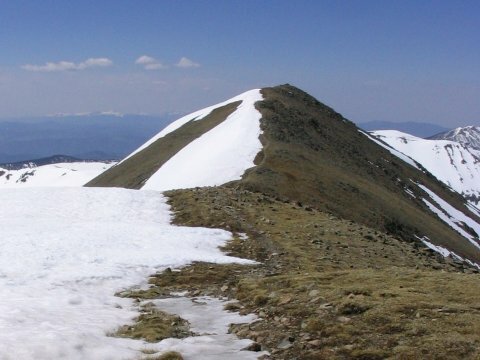 I stepped on the highest point in the snow to claim the second highest point in New Mexico, then continued on the trail (almost completely clear) to the top of Wheeler Peak, reaching the summit at 11:20 am. Almost there! 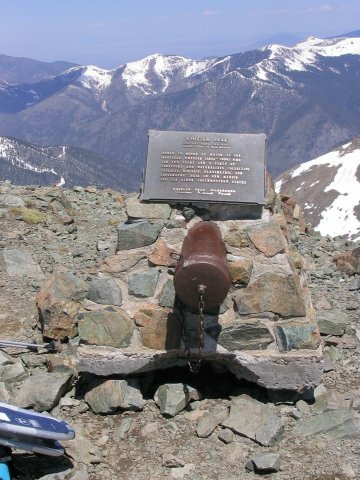 Wheeler Peak seen from the summit of Mount Walter. 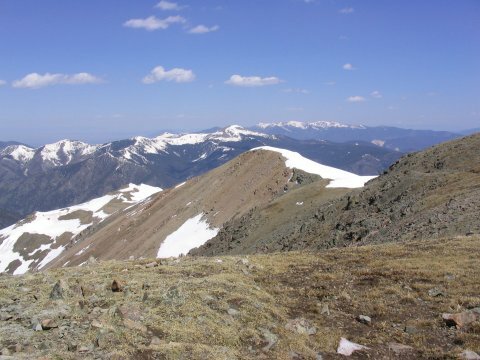 Summit of Wheeler Peak, the highest point in New Mexico. View from the summit. 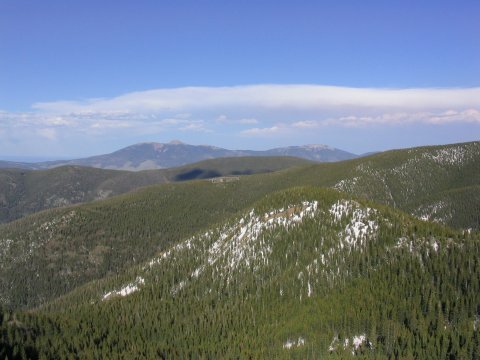 The flank of Mount Walter is at the right of the photo. 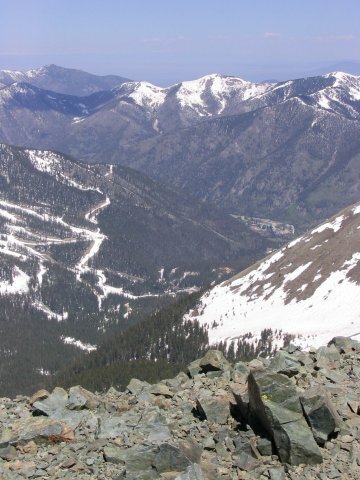 Looking from the summit towards Taos Ski Valley, where I had started. I took some photos from the top, and made an attempt to open the register, but it didn't want to budge. It was late, and, although the clouds didn't look unfriendly (yet), some were starting to appear, and I had a long way back to shelter, so I only stayed on top for around 15 minutes. The wind was starting to pick up, so I took refuge behind the summit cairn/windbreak and ate and drank a bit, and then headed back the way I came. The wind, now a lot stronger than it was on the way up, made it hard to keep my balance on the talus parts, especially with the snowshoes/sails on my back. Although most of the snow was firm enough, I did pass one point where, even wearing snowshoes, the snow was so loose that I fell down and could not stand up again. So, I wallowed/flailed my way along for another 10 feet or so until I came to some firmer stuff where I could stand up again and continue. I'm sure this looked very graceful! (I heard the marmots laughing.) Eventually, I made it back to my camp, where I took a nice long rest, then packed up and headed back to the trailhead, arriving around 7:30 pm, nice and tired. This was a tough hike for me: I only averaged about 1 mile per hour, if even that, about 40% of my usual pace. This was my 18th state highpoint, and definitely the hardest so far.